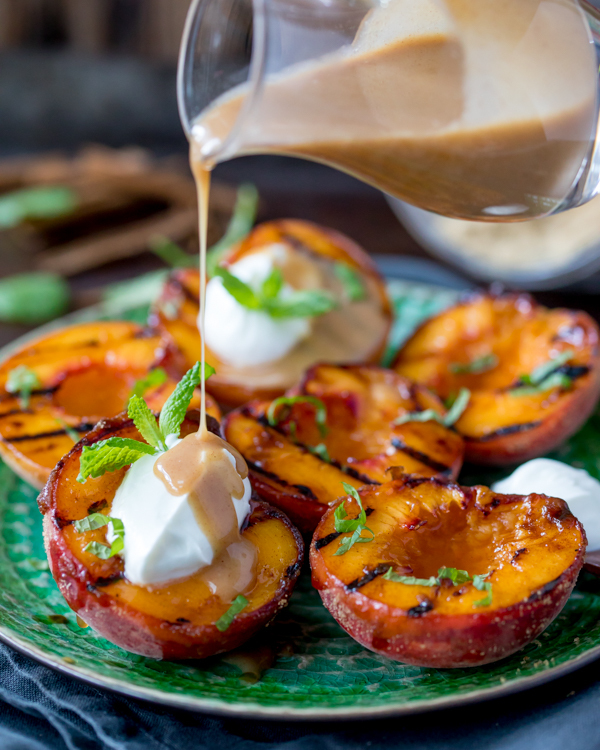 These cinnamon grilled peaches with cinnamon caramel sauce make a tasty, simple dessert. Ready in less than 15 minutes too! My kids aren’t too bad at eating fruit. If there’s a candy or cereal bar alternative, they’ll always go for that first, but I guess that’s kids for you! I love cooking fruit for dessert. Even if it’s fruit, grilled with just a bit of sugar, suddenly the kids are excited. Almost as excited as if I was serving up chocolate fudge cake. So for me, grilled fruit is a winner every time. 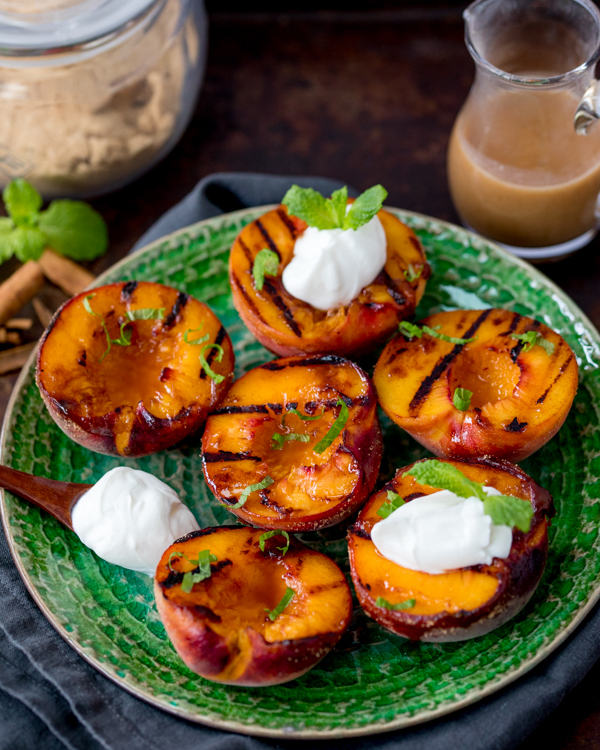 These peaches are brushed with just a little bit of butter, before being grilled until softened and slightly charred. At that point they’re sprinkled with a mixture of cinnamon and soft brown sugar, then grilled again just until the sugar is lightly caramelised. You can serve these as they are, or with a spoonful of creme fraiche, or Greek yogurt. If you’d like to make them a little more naughty, then you can make my easy cinnamon caramel sauce. The same recipe can be used for pineapple or slices of apple too. Why not make a warm fruit salad! Yum! Heat a griddle on a high heat. Slice the peaches in half and remove the stones. Brush the cut sides with melted butter and place cut-side- down on the griddle. Cook for 3-4 minutes on a medium heat until the peaches start to soften and griddle lines appear. 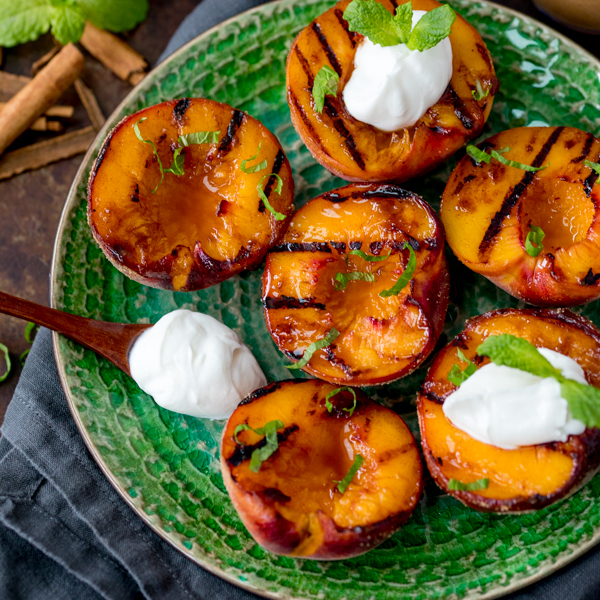 Using tongs, pick up one of the peaches and dip the cut side into the cinnamon sugar. Place back on the griddle, cut-side-down (there’s no need to cook the other side). Repeat with the rest of the peaches and cook on the griddle for 1-2 minutes until the sugar caramelizes. Remove from the heat and place on a serving plate. Pour the leftover butter and sugar into a small pan and heat on a medium-to-high heat, whilst stirring, until the sugar melts (the sugar and butter won’t mix together very well at this point). Stir in the cream and salt until the mixture comes together and pour into a jug. 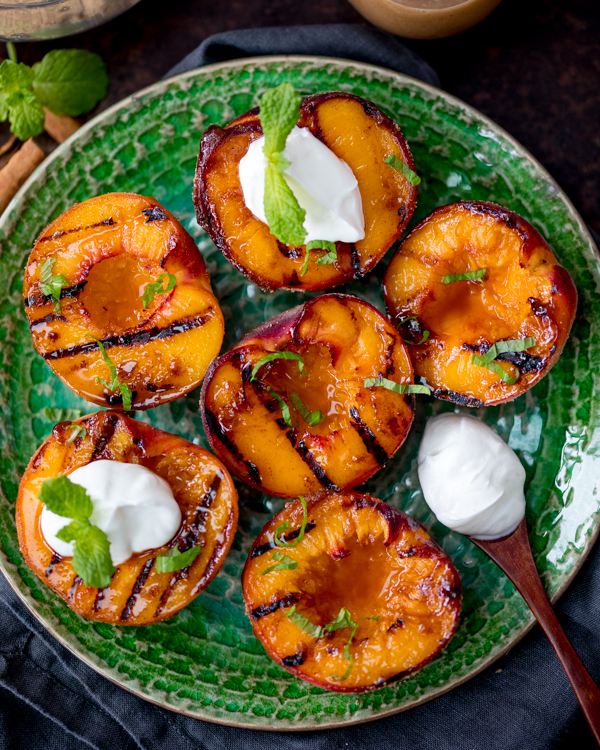 Serve the peaches with the sauce plus a sprinkling of chopped mint leaves and a spoonful of creme fraiche if you like.